Quick question: Do you ever find yourself feeling tired all of the time? Especially after a long day at work, or a day running around after the grandchildren? Maybe it’s not having enough hours sleep? Or perhaps you just find yourself passing up on opportunities because you’re too tired? I see a lot of patients here at the clinic who think being ‘tired’ all the time is just a part of life. Well, let me tell you this… it doesn’t have to be! That tired feeling doesn’t have to be something you have to ‘put up with’ day in & day out. Ultimately the reason as to why you are tired, or allowing yourself to be tired is because of your lifestyle. Imagine this:You wake up, tired because you haven’t had enough sleep so you find it difficult to get through the day. Because of this you decide to rest and not move around as much. Do you exercise…no because you are so tired of course! Then once you’ve had a rest, yet still feel tired, you might have a treat or a cup of tea/coffee. Then once you’re in bed you decide to have a quick look at your phone or e-reader before you finally get to sleep. And then… we’re caught in a vicious cycle. Does that sound familiar? I thought so! A lot of people don’t realize that the way they are living day to day can add to how tired they’re feeling, and the above scenario doesn’t pay attention to what your body actually wants, leaving you and your body out of sync.Think about this – If you are having food just before you go to bed, do you know why you’re reaching for it? The main reason could be that you are lacking energy. 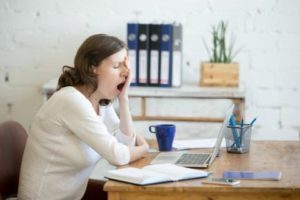 If this is the case your body is likely telling you, you need some sleep, so what can you do instead? Go to sleep! If you like checking your phone before you go to bed or are even on your laptop working, then be careful of the glare. With technology playing a big part in our lives, whether it’s at work in front of a computer or reading a kindle in bed, it can really affect our sleep pattern. All of the devices you have (mobile, tablet, laptop etc…) give out some form of glare. This is because it’s artificial light. We spend the majority of our time looking at these devices which is tricking our mind into thinking it is sunlight. This is why when you go on your phone before bed, your brain still thinks it’s daytime because of the light it has just been looking at. This then makes it harder to get to sleep. Have you ever went to go to sleep and then felt so much more awake, with thoughts racing through your mind? This is because your mind still thinks it’s daytime.To avoid this try not to look at any artificial light an hour before you go to sleep. This gives your brain enough time to understand that it’s time for sleep. If you use technology at work then a common mistake that people make is that they are tired, when in reality, your eyes may just be dry. Before you decide to be ‘tired’, try eye drops and see if it helps. You might surprise yourself. Now the most important part. Sleep. On average you should be getting around 8 hours sleep. Think about it for a second and ask yourself, how much sleep do you get? If it’s more than the recommended then set an alarm clock so that you get the 8 hours sleep. Sometimes if you have too much sleep, it can often leave you feeling lethargic the next day. It might not sound the best setting an alarm clock, especially when you have nothing to get up for but it will help reset your body clock into this new routine. You might even decide to set your alarm earlier than you usually do for work, so that you aren’t rushed in the morning and can ultimately be more relaxed before you go to work. By getting 8 hours sleep, not only will you feel refreshed, but you will feel ready for work and the day ahead. You may even find yourself with more time on your hands! And with more time on your hands, you will have more time to move! You’ll soon find that having more time will give you a clearer mind and give you the opportunity to fit more into your day! Make this one of your healthy habits today!